Bradford City fire 'started by cigarette' Jump to media player A former detective, who was part of the team investigating the Bradford City Fire in 1985, says police have always known the identity of the person who may have accidentally started the fire. Events mark Bradford City fire disaster Jump to media player Events take place in Bradford to remember 56 people who died in a fire at the Valley Parade football stadium 30 years ago. Survivor recalls 1985 Bradford Fire Jump to media player BBC Look North weather forecaster Paul Hudson remembers the 1985 Bradford City Fire as hundreds mark 30th anniversary of the tragedy. Missed warnings: The Bradford fire Jump to media player BBC documentary Missed Warnings speaks to some of the people who were at Bradford City's Valley Parade on 11 May 1985 when a fire took the lives of 56 fans. 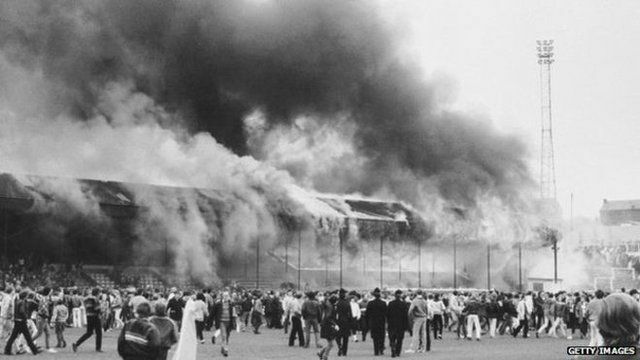 Bradford City fire remembered Jump to media player BBC Sport looks back at the Bradford City fire disaster that claimed the lives of 56 spectators when a stand became engulfed in flames on 11 May 1985. A former detective, who was part of the team investigating the Bradford City Fire in 1985, has told the BBC that the police have always known the identity of the person who may have accidentally started the fire. A dropped cigarette was identified as the likely cause of the disaster which killed 56 people. Retired Detective Inspector Raymond Falconer was speaking on the 30th anniversary of the tragedy. However, in a new book by survivor Martin Fletcher, he claims former chairman Stafford Heginbotham netted millions of pounds from insurance payouts after fires at businesses he was associated with. He makes no direct allegation against the club's chairman in the book, but does ask if any man could be as "unlucky" as Mr Heginbotham appeared to be. Missed Warnings: The Bradford City Fire is on BBC One Yorkshire and Lincolnshire at 22:45 BST on Tuesday, 12 May. It is repeated nationwide on BBC Two at 23:20 BST on Wednesday, 13 May.